The Mets finally got around to disable-listing shortstop Kaz Matsui 25, leaving the Mets without any of their imagined starting infielders this year. In his place the Mets called up AAA slugger Craig Brazell, who will make his Met/Major League debut while wearing No. 9. (updated) Kazuo Matsui met the press this afternoon and tried on his jersey — in a surprise, No. 25. That shirt was most recently worn by coach Don Baylor, who took it from Scott Strickland over last offseason. 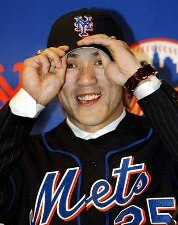 Rumors persist that Kazuo Matsui will take Jose Reyes’ position on the field. Will he also take the shirt off his back? Matsui, the Seibu Lions shortstop who this offseason became the object of Fred Wilpon’s questionable intrigue, has said in interviews that he’d prefer to sign with a team on which he could wear his customary No. 7 jersey. That number, of course, was issued to Reyes way back in spring training of 2002 and was reserved until his big-league arrival last summer. Considering the bend-over-backwardsness and drama with which the Mets have pursued Matsui thus far, the guess here is that the Japanese free agent winds up not only with Reyes’ hard-won position but his digit as well. But here’s a suggestion for the marketing department: Leave Reyes in 7, and give Matsui 77. The Made-For-Photo-Ops middle-infield would be complete.